Small-town 1940s Ontario has been brought back to life, thanks to the Western University Archives. Dubbed "Stars of the Town" by their creator, the late Rev. LeRoy (Roy) H. Massecar (1918-2003), the collection of silent black and white 8mm films representing 88 Ontario locations depicts small town life in the province between 1947 and 1949. To supplement his modest church stipend, The Rev. Massecar filmed people from the small towns, returned to screen the films at town halls and community centres, and invited the "stars" to attend for a modest admission price. The Rev. Massecar concentrated mostly on faces, but in between glimpses can be seen of streets and shops and old cars and trucks, and even horse-pulled wagons. In the years after these films were made, life in small town Ontario changed inalterably as a result of the onslaught of mass suburbanization, as young men and women moved away from their birthplaces for jobs in larger urban centres, leaving many of the towns to decline or to be swallowed by bigger neighbouring cities. The films were donated to Western Archives by Roy's wife, Marion Massecar, in 2005. Since then, the films have been converted to DVD format and are now available to order. "Stars of the Town" captures a way of life that epitomized small town 'Old Ontario' in the immediate post World War II era. 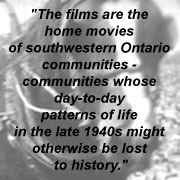 The films have been described as "the home movies of southwestern Ontario communities - communities whose day-to-day patterns of life in the late 1940s might otherwise be lost to history."